In biology we often speak of model organisms. This refers to using lower organisms that can be used to test theories or medications and extrapolating the results to human biology. Often in medical research other vertebrates such as monkeys, rats, mice and rabbits are used to test new medicines. These vertebrates are generally more similar to the human system than lower organisms such as invertebrates. However the complex nervous system of vertebrates requires that we be humane in our research so that we do not cause suffering. Vertebrate research requires special permits and oversight by ethics committee. Vertebrates are rarely used in the high school biology lab. On the other hand invertebrates such as crayfish, worms, daphnia, flatworms, insects can be freely used in the lab or classroom because it is unlikely that they experience suffering the way vertebrates might. Scientists carefully select model organisms based on what they are studying. For example the roundworm c. elegans, and the fruitfly drosophila are extensively used because their biology and genetics are well know and they are easy to grow in the lab. Vertebrates share much of the basic neurobiology with invertebrates. Still it important to verify that the particular model organism is analogous to humans before you draw conclusions. For example Pyrethrum is a natural pesticide made from a kind of daisy. The chemical is poisonous to insects but is safe on humans. Pyrethrum works on sodium channels in the nerves, but humans have enzymes that can break down the substance quickly. One challenge with working with lower organisms is that they are small and it is hard to measure changes in their nervous systems. If an animal has a characteristic behavior you can observe this behavior to see what effect a chemical might have on its nervous system. Sometime we simply apply a series of doses of a chemical until the organism dies. For example Daphnia was used for years in toxicity testing. The LD50 for an animal is the dosage of chemical that leads to a 50% mortality. They are easy to grow in the lab. They are lower organisms which are unlikely to feel pain. They have some observable behavior or nervous action that can be measured. They are likely to be affected by the compounds we are testing. Other invertebrates have been used for neuroscience research. 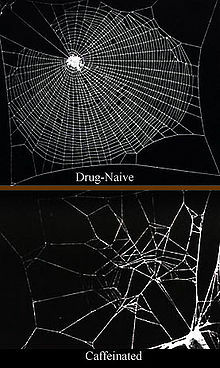 Researchers have recorded the effects of neuroactive drugs on the spider web making. The sea slug Aplysia and the Giant Squid Axon been used to study nerve conduction, reflexes, and simple learning because it has very large neurons. Even the tiny fruit fly has been used to study nervous systems.